The Star Wars: The Old Republic: Encyclopedia (that's a lot of colons) was released in 2012 to serve, as its sub-title claims, as "The Ultimate Guide to the Epic Conflict". Initially it was quite expensive, and not unfairly so, since it's one of those giant hardcovers with big, colourful pages and lots of pictures, but once it turned out that SWTOR wasn't turning out to be the next World of Warcraft, retailers quickly slashed the prices, which is when I decided to pick up a copy of my own. I remember being quite pleased with it when it arrived, but then I opened it on a random page and landed on what were basically spoilers for the entire bounty hunter story. As I was nowhere near having completed all the class stories yet at that point, I went "argh" and banished it to the top of a shelf, never to be touched again. Well, I was planning to read it after there was nothing left to be spoiled for me, but then I just kind of forgot about it... until recently, when I realised that actually, it's been safe for me to finally read it for a while. I slowly leafed my way through it a couple of pages at a time and actually found it quite enjoyable. 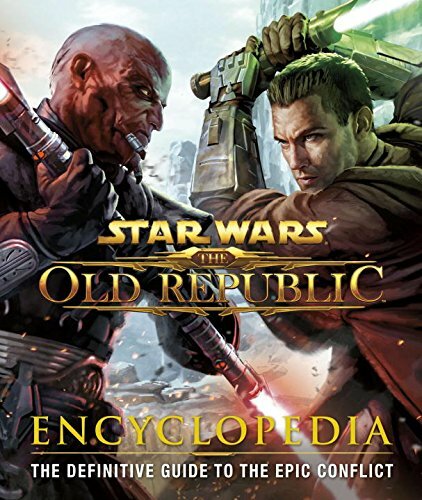 There are a lot of little lore bits and pieces about the base game in there that are nowhere to be found in the game - well, some might be hidden in codex entries that I haven't read or forgotten about, but I'm sure a lot of them are exclusive to this book. - that Chancellor Saresh grew up a slave on an Imperial planet but escaped by leading a revolt? Or that she had a husband who died when the Sith retook Taris? I know that in many ways she's been set up as the kind of character that people love to hate, but if that woman doesn't have genuine reason to hate the Empire, nobody does. - that Senator Dodonna (from the smuggler story) was nicknamed "Shimmersteel" and had a reputation for using her feminine viles to her advantage in politics? - that General Garza (from the trooper story) was married three times, one of them to the head of the Strategic Information Service, Marcus Trant? - that Jedi Master Oteg (from Taral V/Maelstrom Prison) used to be a member of the Jedi Council but stepped down because he was more needed as Fleet Admiral? - that Master Orgus (from the Jedi knight story) was close friends with Harron Tavus of Havoc Squad? - that Jaric Kaedan was the one who led the strike team that originally captured the Dread Masters? - that the late Lord Kallig's first name was Aloysius (teehee)? Anyway, the main point of this post is simply that I really enjoyed the book and if you are a big fan of the game too, I can only recommend picking it up. Thanks for the random facts, they were quite enjoyable indeed! For fans of the game I think it's well worth having, providing you can get it at a decent price these days.